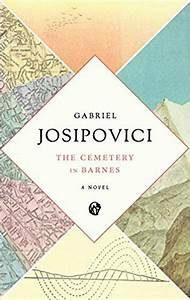 Gabriel Josipovici’s The Cemetery in Barnes (2018) is a very short novel, with the story spread across a mere one hundred pages. However, this is a novel of burning intensity that leaves the reader in a constant state of uncertainty with plotline that jumps between different phases in the protagonist’s, an unnamed translator, life. These are structured around his life in Putney, London, with his first wife, the strict routine he adopts as a widower in Paris, and finally his present world living in rural Wales in converted farmhouse with his second wife. Woven throughout the book are the translator’s reflections on various art that he admires. The writings of 16th century French poet du Bellay and the music of Monteverdi (especially his opera Orfeo) are referred to, and reflected upon, by the protagonist throughout. This gives the reader a greater insight into the thoughts of the unnamed man and reveal another aspect of his character. As the novel progresses, it becomes apparent that the translator’s adoration for these forms of art are borderline obsessive. The man claims the works have a ‘mysterious power’; their subject matter is dark and he remarks that he wants ‘to live in darkness forever, never to have to get up, never to have to draw the curtains and see the light of day’. He speaks of ‘giving way to the fury of an angry sea’ and thus the reader infers that something sinister inhabits the protagonist’s mind. References to the beloved art of the protagonist only become more unsettling as the plot enters darker territory. The accounts provided of the translator’s past lives and experiences are repeated in the novel, and subtle variations on these accounts occur throughout, if the reader pays close enough attention to the text. Ultimately, how these differing accounts are interpreted is a matter of individual reading. As one excerpt teases us, ‘In one life there are many lives. Some are lived and others imagined.’ It is Josipovici’s refusal to clarify the separation from reality and imagination which is one of the book’s great strengths, placing it in a unique category of novels where ambiguity is a structuring feature (a very different novel, American Psycho (1991) springs to mind). Josipovici does not waste time in introducing the dark themes that run throughout the novel. By page thirteen, the protagonist’s fantasies of drowning are disclosed, and this sets the tone for the rest of the novel. Other disconcerting descriptions are to follow soon after. The relationship between the protagonist and his second wife, and details of the unnamed translator’s harrowing habit of stalking his first wife, are two obvious examples. These descriptions, combined with the translator’s long walks alone to visit various cemeteries where he would ‘find his favourite bench, sit staring out into space, and let his mind go blank’ will be sure to pull you into this eerie novel. The book leaves one trying to decide just who exactly this male protagonist is, and what is it that has he done. Is he the self proclaimed ‘creature of habit’ who used strict routine with which to come to terms with the misfortune dealt? Or is something more menacing being suggested? Regardless of how the individual interprets the novel, The Cemetery in Barnes manages to both intrigue and disturb in equal measure. As a result, the novel triumphs and undoubtedly deserves its place on the Goldsmiths shortlist. When finished, Josipovici’s work will repay revisiting.